How do you evaluate an HVLS fan? › How do you evaluate an HVLS fan? So here is the million dollars question: How do you evaluate an HVLS fan? Maintenance Schedule: This is important to know. Fans with gearboxes would require maintenance at some point in time. The blade profile is vital to being efficient in moving air. But without robust scientific data, all this is soft talk. Let us discuss the above parameters in more detail. Air Flow is proportional to Motor Output Power. 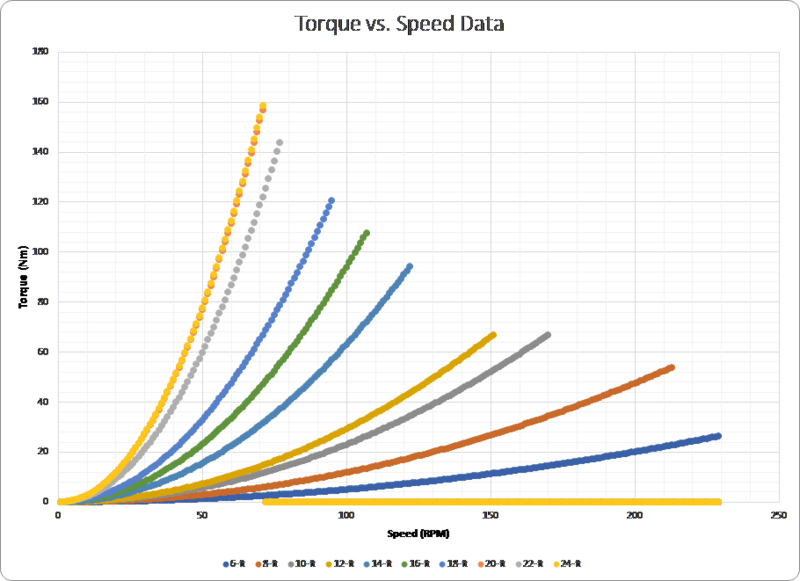 Bigger blades require more torque than smaller blades. See our chart below for various blades. Air Flow is proportional to Motor Output Power. Motor Input Power at Max Speed (W): Most companies do not give you data for the output power. The evidence for input power is readily available. The Power is an indication of the efficiency of the motor and drive system. Usually, a geared motor would be 60% efficient compared to a direct drive motor which could be 85% efficient. Higher input power does not necessarily mean that it is converting into the air flow. Air Flow is NOT proportional to Motor Input Power. Sound Level (dB): Most companies do not perform this test. However, we can comfortably identify silent fans from the noisier geared fans. Gears may not fail, but they would start getting louder and more boisterous over a period. The sound is an essential aspect of fan performance. Not all direct drive fans are quiet. Sound signature depends not only on the motor construction but also on the motor inverter and software inside it. Epoch fans are the softest in the industry. Air Flow (CFM): Most companies do not publish this number. They prefer to use air velocity numbers (m/s) which are meaningless for most of the end consumers. Standardized testing of this parameter would be most beneficial to the end users. Weight (kg): HVLS fans with geared motors can weigh as much as 350 lbs. Almost twice as much as direct drive fans. So considering a geared fan is a fool's game. It is a safety issue, and it is an unnecessary amount of metal hanging from the ceiling. Then again not all direct drive HVLS fans are created equal. Some are deficient power, others overheat. Only EPOCH HVLS fans are designed correctly for the perfect performance. They are neither low power nor over-heat and nor they have the weight baggage of the geared HVLS fans. Warranty: It is excellent to see some great warranties in HVLS industry. More extended guarantee gives you the best comfort of mind. Direct drive fans could last you a lifetime but not so is the case with geared fans. Maintenance Schedule: This is a fun one. If it is not a direct drive fan, there is maintenance required of all gearboxes at some point in time. First, they start making noises, and after that, they would begin to move erratically. Oil would need to be changed in these gearboxes as well at some point in time. Whereas, direct drive fans should require no maintenance over their lifetime.